Aegina Greece is a beautiful, verdant island, located just 17.5 nautical miles from Piraeus Port occupying an area of 84 sq. km. It is characterized by its idyllic landscape, important history and island charm. Aegina Island is a wonderful destination for vacations all year round. Its close proximity to Athens and in general Mainland Greece, means that it is a popular weekend holiday spot for many Athenians, as well as vacationers in Athens who want to do a bit of island hopping. The island has an excellent tourist infrastructure, with an abundance of Aegina hotels, apartments and rooms for rent, restaurants, bars, shops and organized beaches, as well as professional car rental agencies and highly-reliable travel agents. Aegina Town is a picturesque village and the capital of Aegina Greece. The town is packed with quaint house, blue-domed churches, narrow alleyways and small shops. Many of the traditional houses have been converted into Aegina hotels, offering visitors a “taste” of genuine life on the island. If you want to relax on an island that has got everything you could ever wish for, come to Aegina Greece where you may admire one of the most beautiful sunsets of the Mediterranean Sea that will arouse your senses and bring in mind the sweetest thoughts. Aegina comprises an island with remarkable tourist infrastructure and pleases visitors with the wide range of accommodation options. Whether you desire to stay in luxurious hotel resorts and spacious apartments or you are on a budget holiday and wish to lodge in one of the convenient rent rooms or pensions, you will definitely come across what you are looking for. All accommodation units will cater to your every need and will provide you with up-to-date facilities while the first-rate services and welcoming staff guarantee an enjoyable, carefree stay. The island of Aegina boasts charming little settlements, both nearby the sea and at the inland, which are all of great beauty, with their traditional houses, bright churches, fields of Aegina Peanuts on the hilly areas and small harbours at the seaside villages. You can find accommodation meeting your expectations in one of the Aegina (Aigina) hotels, apartments and rooms for rent not only in the busy and yet adorable Aegina Town but also in Agia Marina settlement, famous for its stunning sandy beach and natural areas, Souvala that is well-known for its therapeutic hot springs and Perdika, a lovely fishing village, celebrated for its crystal-clear waters. Other settlements you can stay at are Anitsaio, Marathonas, Aeginitissa, Souvala and Agii. Aegina has a rather lively nightlife offering a wide variety of entertainment venues and dining spots, especially at the most popular settlements of the island, such as Aegina Town, Agia Marina and Perdika. There is a plethora of nightclubs and bars for all tastes, seaside restaurants and tavernas serving local delicacies that will enthuse you, while at several of the beaches you will find beach bars with music, serving cold beverages and snacks from early in the morning till the evening. At the settlement of Faros you can have fun at the Water Park waterslides. On the island of Aegina a great deal of religious festivals and cultural events take place all year round. Traditional events aficionados may attend the Agios Nektarios festival, who is the patron saint of the island, on November 9. In Aegina Town there is a series of events each summer “The Cultural Summer” when concerts, plays, book presentations and lots more take place. If you happen to be on the island mid-September, we suggest you attend the revival of a religious custom named “Leidinos” when a replica of a man is buried and then resurrects, symbolizing the end of the summer and the passage to autumn and winter. This event takes place at the settlement of Kypseli. Aegina Greece possesses a plethora of historical sites, many of which are very well-preserved and provide visitors with a look into the glory of Ancient Greece. The most significant sites marked on every map of Aegina, so that visitors can easily locate them, are the Ancient Site of Aphaia near Agia Marina, the Ancient Site of Kolona, the Temple of Hellanios Zeus, and the Archaeological and Folklore Museums in Aegina Town, the Kapralos Museum with paintings and sculptures, the old town (Byzantine Aegina) and the monasteries of Agios Nektarios and Panagia Chrysoleontissa, in Paleochora. Most Aegina hotels offer travel information about the island and the “must’ attractions, so don’t hesitate to ask the hotel management for information. Aegina possesses wonderful beaches with crystal clear waters as well as beautiful sheer coasts for those of you who prefer a swim in the peace and quiet of a remote place. The most popular beaches on the island are those of Aegina Town, Agia Marina, Souvala, Marathonas, offering water and beach sports facilities as well as cafés and taverns, being able to compete even with the most well organized beaches of the Aegean Sea. The beautiful beach of Aeginitissa charms holiday-makers with the green blue waters and lush vegetation creating a cooling shade, while Vagia and Portes beaches are ideal for relaxation in the sun and enjoying the tranquil setting. We also suggest visiting the island of Agistri, which is located opposite Aegina Greece. On Agistri Island, you can swim at golden sandy beaches and rocky, secluded shores, which are ideal for fishing, as well. The weather of Aegina (Aigina) Island does not differ to that of the other islands of the Saronic Gulf, which are all affected by the Mediterranean climate prevailing in Greece. Thus, the weather during winter months is mild with particularly rare rainfall, while summers are cool and pleasant for holiday-makers. The climate in general can be described as dry giving the opportunity for sunny vacations and lots of outdoor activities. 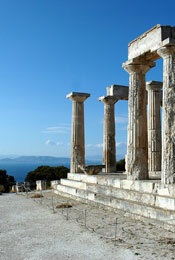 Aegina is at close proximity to Athens making it an ideal destination even for daily trips. Ferry boats depart to Aigina (Aigina) Island from Piraeus Port and the trip lasts for 1 hour and 15 minutes, while trips by hydrofoils last for 35 minutes. Ships arrive at Aegina Town Port all year round. There are also direct trips to Souvala Port while during summer months there are departures for Agia Marina Port, as well. © United on line S.A.